Ladies of all ages are very welcome and we are very proud to state that our organisation has been in existence since it was founded by Mrs Janet Egan back in 1957. 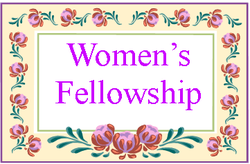 To encourage the continuity of the Women's Fellowship in their work as a group of women who have and still do support the work of our parish. To provide a forum for women to meet on a regular basis in order to foster a Christian and community spirit. To organise events that enhance the social, artistic, educational and health and well-being needs of the group. The raise awareness and understanding of different cultures and backgrounds. To foster learning and self development by providing facilitated sessions, discussions and guest speakers. Above all as our names suggests, it is a time to have fellowship with others and a friendly chat over a cup of tea. Please feel free to come along and bring a friend if you wish. It costs only £10 for the annual subscription which is used to cover donations for our guest speakers.